Hi guys!! All doing weelll? 🙂 I’m, its been quite chaotic juggling 500 things within a particular period. But I’m standing tall! 😀 If you feel this same way you’re not alone, you are doing the best you can, and that’s ALL THAT MATTERS ! Woot I’ve only been gone for a bit, and I feel weird being away. Away? I’m never completely off my blog though. It’s like leaving a little baby unattended to. I couldn’t. That being said, I spent time learning and understanding the different body types and I encourage everyone to spend just a little more time learning how beautiful you can style yourself, it adds a whole of lot confidence and personality to your looks. It saves you money and time. And you are pretty much choosing the right things when you shop ( I’m not a fan of returning things, it’s burdensome). Every woman’s body is unique and there’s one, two or three thing(s) someone else is loving about your body type. Won’t it be cool if you worked to enhancing those. I’ll discuss more of these in another post. All set for Fall? If you follow my Instagram I did post a preview of this outfit, I’m in love with the details and these ‘Thigh highs’ they are absolutely amazing. 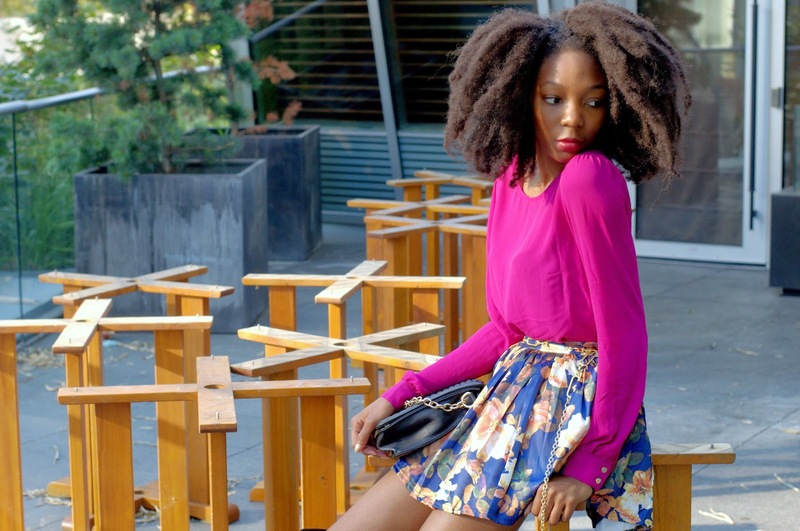 It brings great contrast to the bright beautiful colored shirt as well as the high waisted floral skirt. It’s getting colder in this part of the world and a fantastic item to have set ready for the season are knee high boots or thigh high, or even stockings. They add several splashes of elegance to an outfit. What do you think about the pairing? Smile a lot! Enjoy every moment of your weekEND 😀 ! Look at that hair! I love the colors hun. Now those are some killer boots BAAM!! aww thank you! I appreciate that. And you are still stending up with a lot of glam! this outfit is fabulous! Fantastic look dear, I love the skirt!!! You know i love those boots. I've been slaying you close to a year now…you style resonates with me a lot….great style….I love how you do it all…..